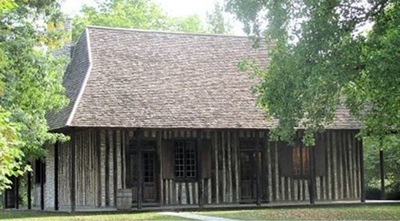 Above is the present day restored Cahokia Court House, former home of Jean Francois Saucier in Illinois. It was sold in 1793 by Jean Francois to the county and it became the Cahokia Court House. It is located today in an Illinois State Park and used as a museum. Some mistakenly credit the original ownership to Jean Baptiste Saucier, which is incorrect. The courtroom has been refurbished to the way it would have been in the early 19th century. ​The old Cahokia log home is believed to have been built in 1737 as a four-room private residence by Jean le Poincet and acquired in later years by Jean Francois from his first wife's family as her dowry. It was here that Jean Francois' six children with his first two wives, Marguerite Cadron and Angelique Lapensee were born. His other eight children with third wife Marie Francoise Nicolle were born and raised in Missouri. It is the oldest house in Illinois as well as the mid-west. 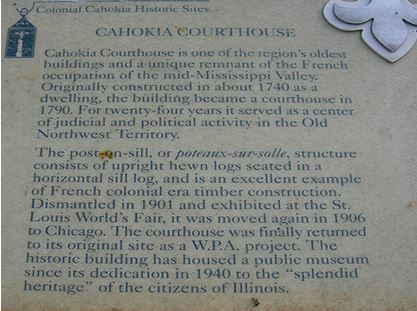 Today the Cahokia Courthouse is an example of the early French Creole poteaux-sur-solle (post-on-sill) construction method which French settlers brought over from their native Normandy in northern France. In this method upright hewn logs are seated on a horizontal log sill and the spaces between the logs are filled with stone and mortar chinking. This type of construction is different from the more familiar horizontal Anglo-American style and is quite rare with only about thirty buildings of this type left in North America. The vertical-log Courthouse has a double-pitch roof of cedar shingles and galleries on all four sides. The book "Old Illinois Houses" by John Drury, states that in writing of this historic Illinois shrine in the June-July 1941 issue of the "Bulletin of the Illinois Society of Architects" a state architect named Joseph F. Booton wrote that "the structure originally had its interior walls plastered on split lath. (Narrow strips of wood or split boards, nailed horizontally across the wall studs or ceiling joists and then plaster applied over the wood). Interior features include two massive limestone fireplaces on each end, shuttered casement windows with glass panes, French-style doors, shutters, beautiful wrought-iron hardware, beaded beams and ingenious roof-trusses. The house was constructed of Black Walnut logs with grooved joints. The interior had four rooms and an attic living area". A masonry vault or cellar with a vaulted ceiling was located under the house with steps leading down into it. 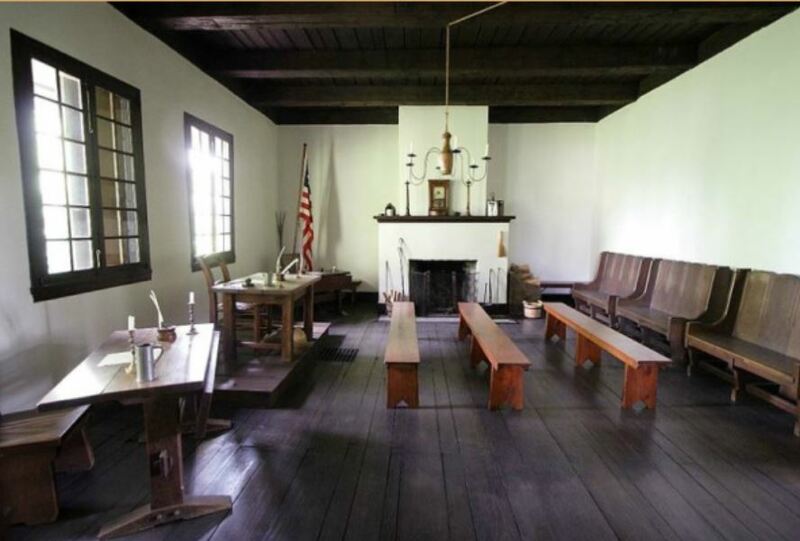 During its Court House era the largest room was used as the courtroom with the other rooms being used as a judge's chamber, a multipurpose room that also served as the post office, and a meeting room for attorneys which also doubled as schoolroom when court wasn't in session. Today, located inside the old courthouse are three exhibit rooms and another furnished to represent the courtroom in the 1790's. Exhibits in the Courthouse depict issues that came before the court around 1800 and a history of the structure as it was in the early twentieth century before its move to St. Louis and Chicago and before its eventual return to Cahokia. When the Treaty of Paris was signed in 1783 ending the American Revolution, the Illinois Country came under control of the United States. In 1789 the Northwest Territory was created by the Continental Congress and in a ceremony in 1790 in Cahokia a proclamation issued by Governor Arthur St. Clair, the new governor of the territory, was read laying out the county that bears his name and establishing the county seat at Cahokia. In that same year Jean Francois Saucier was elected Clerk of the Court and his brother Jean Baptiste Saucier was elected as a Judge. The County Court and its judges, of St. Clair County, began using the Saucier family's residence as an administrative center and courthouse that same year, formally purchasing the building in 1793 for $1000.00 from Jean Francois. Here in the former Saucier family home at Cahokia were held the first American court sessions and the first election in the Illinois country. Originally St. Clair County was an immense territory almost as large as the state of Illinois, but as the years went by portions of the county was split off to form separate counties. For twenty-four years the Cahokia Courthouse served as a U.S. territorial courthouse and an important center of political activity in the Old Northwest. By 1814, with St. Clair County's jurisdiction decreasing to its present size, demands for a centrally located county seat, and floods constantly threatening Cahokia, the county seat was moved to the newly created town of Belleville. By 1901 the former courthouse had deteriorated so badly due to floods and neglect that it was used only to store farm machinery and had been bought by an East St. Louis businessman who had it dismantled and reassembled for the 1904 Louisiana Purchase Exposition in St. Louis as a classic example of early French Creole architecture. The structure at the Exposition was only about half the size of the original, with leftover timbers reportedly made into wooden cigars and sold as souvenirs at the Fair. After the Exposition the Chicago Historical Society purchased the courthouse and a small structure was constructed from the materials on Wooded Island in Jackson Park. The building stood there until 1939 when it was dismantled and returned to Cahokia. Reconstruction of the courthouse in its current form began as a WPA project. Archaeological investigations of the original site began in 1938 and uncovered the original foundations, fireplace footings, fragments of porch columns, domestic objects and fragments of ironwork. In 1939, following a study of photographs, sketches of the building and of French Creole construction methods, the courthouse was then dismantled and shipped to Cahokia with great care. All of the logs returned from Chicago were incorporated in the reconstruction along with some new materials. The courthouse was dedicated May 20, 1940 as a reminder of the "splendid heritage" of the citizens of Illinois. The courthouse now rests on its original foundation of stone nearly two feet thick. Walnut beams extend the cantilevered roof over the porch. Inside, the courtroom has been refurbished to the way it would have been in the early 19th century and the other three rooms contain exhibits that illustrate French colonial life, the history of the courthouse, Lewis and Clark’s experience in Cahokia during the winter of 1803-04, and the role of post offices in colonial America. The Cahokia Courthouse is the centerpiece of the Colonial Cahokia State Historic Sites complex that also includes the Jarrot Mansion, the Martin-Boismenue House, and a Visitors Center. Cahokia Courthouse in 1972 was placed on the National Register of Historic Places. Historical facts giving its origins as the former home of Jean Francois Saucier and his family and its history as the County Court House are posted in the museum. Cahokia officially became a part of the United States on July 5, 1778. 30 mounted Virginia Rangers and a like number of French militiamen under Captain Joseph Bowman took Cahokia without resistance. Soon after, the 105 Cahokia "heads of household", including the Saucier family members, swore allegiance to the Continental Congress of the United States. Cahokia was later named the county seat of St. Clair County following the passage of the Northwest Ordinance of 1787. For the next 24 years, the Cahokia Courthouse served as a United States territorial courthouse and an important center of political activity in the region. The old Jean Francois Saucier family home had a colorful era after is sale to the County of Cahokia, first as the Cahokia Court House, then as a saloon, a home once again, a display at the Chicago World’s Fair as well as other uses before it was bought and restored by the State of Illinois as the Cahokia Court House Museum. There have been some articles written giving the ownership of the Cahokia Court House in Illinois as Captain Jean Baptiste Saucier, which is incorrect. 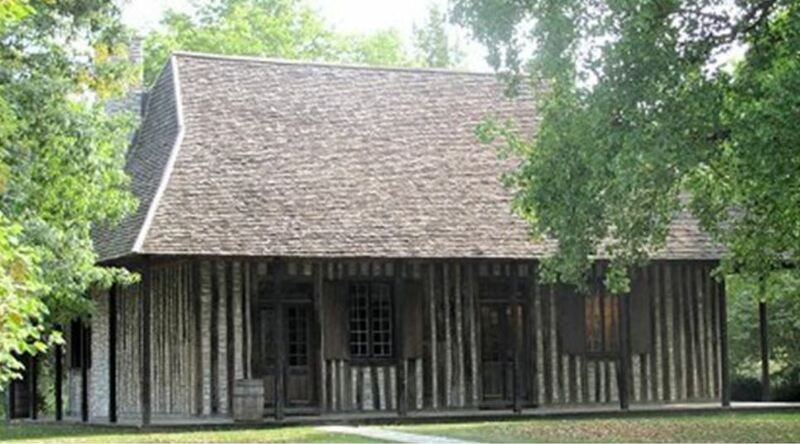 The owner who had received the old home as part of his first wife's dowry and then sold it in 1793 to become the Cahokia Court House was Jean Francois Saucier, the son of Francois Saucier the engineer of the colony. The house was still owned by the Saucier family when George Rogers Clark, in 1778, captured the Illinois country from the British and when, a few years later, the Northwest Territory was formed.